Comfortable rooms with tiled stove, whirlpool and canopy bed, spacious wellness and beauty area with indoor pool, various saunas & a broad offer of massages, excellent cuisine. Welcome to the Wellness Refugium & Resort Hotel Alpin Royal****s! At the Hotel Alpin Royal, clocks are unnecessary. The special flair of the entirely new wellness and resort hotel invites you to experience unforgettable moments with luxurious and cozy comfort. Let your dreams carry you away into a wonderful world, which will enchant your senses. Here a door opens to a unique world of pure well-being. Enjoy the comfort of the restful rooms and suites equipped with canopy bed, tiled stove, whirlpool, stocked mini bar, hairdryer, safe, telephone, satellite TV, Pay TV, internet access and much more. The wellness area offers relaxing delights with its Finnish sauna with tiled stove, herbal steam bath, Laconium, infrared cabin, ice fountain and waterbeds. Let warmth, water, aromas and optical attractions seduce your senses. The entire structure was designed and built by the renowned company Thermarium. In our beauty world, the focus is on your beauty and health, offering holistic relaxation, beauty and health treatments, an array of massage therapies and special beauty programmes for him and her. Our highly qualified wellness experts will pamper you with exclusive cosmetic products. Not least, our creative kitchen staff under the guidance of a culinary master is taking pride in placing heavenly aromas and earthly delights onto every plate. Everything is ready for your arrival. Let us pamper your body and soul and take a little time for your dreams in Hotel Alpin Royal****s! Kept in hues of red, green and yellow. This room is furnished with shower, WC, Bidet, BVLGARI White Tea Luxus Collection, hair dryer, bathroom scale, make-up mirror, telephone, safe, temperature controls, blinds, sitting area, Flat Screen TV, Laptop Connectivity, radio, coffee maker, well-stocked minibar and balcony. Also kept in hues of red, green and yellow. This room is furnished with shower, WC, Bidet, BVLGARI White Tea Luxus Collection, hair dryer, bathroom scale, make-up mirror, telephone, safe, temperature controls, blinds, sitting area, Flat Screen TV, Laptop Connectivity, radio, coffee maker, well-stocked minibar and balcony. These romantic suites on the first floor are dedicated to the rose and are furnished with shower, WC, Bidet, BVLGARI White Tea Luxus Collection, hair dryer, bathroom scale, make-up mirror, telephone, safe, temperature controls, blinds, sitting area, Flat Screen TV, Laptop Connectivity, radio, coffee maker, well-stocked minibar and balcony. The mystical color blue will capture you. The Arabian nights Suite is located on the 2nd Floor and is furnished with with shower, WC, Bidet, BVLGARI White Tea Luxus Collection, hair dryer, bathroom scale, make-up mirror, telephone, safe, temperature controls, blinds, sitting area, Flat Screen TV, Laptop Connectivity, radio, coffee maker, well-stocked minibar and balcony. Special feature: the fairy tale canopy, inviting you to dream sweet dreams. Kept in an elegant hue of red, theses suites are stretching towards the sky on the 3rd floor. Look forward to shower, WC, Bidet, BVLGARI White Tea Luxus Collection, hair dryer, bathroom scale, make-up mirror, telephone, safe, temperature controls, blinds, sitting area, Flat Screen TV, Laptop Connectivity, radio, coffee maker, well-stocked minibar and balcony. Dreamy and romantic is the first impression of the Romantic Suites, kept in peach tones and with a poster bed. The whirlpool or massage showers invite you to relax. The suite is furnished with WC, Bidet, BVLGARI White Tea Luxus Collection, hair dryer, bathroom scale, make-up mirror, telephone, safe, temperature controls, blinds, sitting area, Flat Screen TV, Laptop Connectivity, radio, coffee maker, well-stocked minibar and balcony. The Sun Suite happily welcomes you with its warm red hues. For your special comfort it also offers a second bedroom for 1-2 additional persons. The suite is furnished with shower, WC, Bidet, BVLGARI White Tea Luxus Collection, hair dryer, bathroom scale, make-up mirror, telephone, safe, temperature controls, blinds, sitting area, Flat Screen TV, Laptop Connectivity, radio, coffee maker, well-stocked minibar and balcony. A soothing yellow invites you to snug up in this suite. Special features are an impressive four poster bed, a separate room for an additional person and the whirlpool to relax. The Glacier Stream Suites are furnished with whirlpool, WC, Bidet, BVLGARI White Tea Luxus Collection, hair dryer, bathroom scale, make-up mirror, telephone, safe, temperature controls, blinds, sitting area, Flat Screen TV, Laptop Connectivity, radio, coffee maker, well-stocked minibar and balcony. The Sovereign Suites invite you to a royal vacation. They feature 2 separate rooms and a whirlpool. The suites are furnished with whirlpool, WC, Bidet, BVLGARI White Tea Luxus Collection, hair dryer, bathroom scale, make-up mirror, telephone, safe, temperature controls, blinds, sitting area, Flat Screen TV, Laptop Connectivity, radio, coffee maker, well-stocked minibar and balcony. Alpin Wellness in green and yellow. The living rooms tiled stove invites you to relax comfortably, the whirlpool will energize the senses. The suites are furnished with whirlpool, WC, Bidet, BVLGARI White Tea Luxus Collection, hair dryer, bathroom scale, make-up mirror, telephone, safe, temperature controls, blinds, sitting area, Flat Screen TV, Laptop Connectivity, radio, coffee maker, well-stocked minibar and balcony. Suites made for dreaming, all in red, welcome you with special comforts. A living room, a master bedroom and a childrens bedroom offer lots of room for your dreams. The suite is furnished with a large bathroom with shower, WC, Bidet and whirlpool, BVLGARI White Tea Luxus Collection, hair dryer, make-up mirror, telephone, safe, sitting area, Flat Screen TV, Laptop Connectivity, radio, coffee maker, well-stocked minibar and balcony. 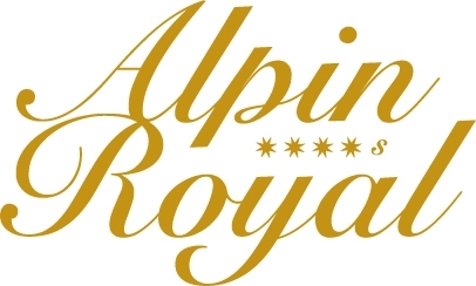 Make sure you take advantage of our 20% Alpin-Royal-Early-Booker discount by making your reservations at least 60 days ahead of time. Make reservations at least 60 days in advance and take advantage of a 20% discount with our Alpin-Royal-Early-Booker-Offer. Book your vacation at least 40 days in advance and receive a 20% discount on your reservation with our Alpin-Royal-Suite-Early-Booker-Offer. Days under the symbol of friendship. Experience wonderfully pampering moments at the Royal Spa and relaxing champagne times with your best friend. Enjoy your time together in our Wellness Refugium & Resort Hotel Alpin Royal****S and discover sensuality anew while enjoying luxurious wellness moments and finest cuisine at candlelight. To make someone happy with a special surprise – effortless now. Give beautiful days in the realm of harmony and delights in the cozy ambience of our Wellness Refugium & Resort Hotel Alpin Royal****S.
Enjoy probably the most beautiful and cherished weeks of your life in our Wellness Refugium & Resort Hotel Alpin Royal****S and discover the romantic beauty of the Ahrn Valley. Treat yourself to some relaxing times and be pampered at our Wellness Refugium & Resort Hotel Alpin Royal****S, enjoy excellent menus, precious wines, courteous ambience and soothing Treatments. Experience unforgettable moments during a breathtaking helicopter ride over the Dolomites and enjoy fascinating views of the South Tyrolean mountainside during your exclusive dream vacation. Enjoy a good game of golf & complete your proficiency certificate at one of South Tyrol’s most beautiful courses. Enjoy your first golfing successes during a special advanced training Course. A golfing vacation for top-notch golfers. Spend exclusive golfing days at our Wellness Refugium & Resort Hotel Alpin Royal****S at the green heart of the South Tyrolean golfing region. Get closer to nature! You will discover the most beautiful places in South Tyrol anew while enjoying the cross-country runs. Step by step you will be mesmerized by the beauty of the pristine winter landscape and enjoy the most peaceful and tranquil side of winter. Wonderfully spacious carving tracks, panoramic slopes and family runs await you. Treat yourself to 4 days in winter wonderland! 7 days full of adventure and zeal in the Ahrn Valley ski area: Beautiful slopes, quaint huts to enjoy a rest and idyllic winter moments will make your stay unforgettable! Take a deep breath and feel liberated and free at our exclusive Respiration-Health-Resort Alpin Royal****S.
Family vacation filled with happiness, joy and adventures awaits you at our Wellness Refugium & Resort Hotel Alpin Royal****S at the heart of the Ahrn Valley mountains. A delighting weekend with superior wellness, wonderful encounters with nature and finest cuisine – make your reservations now at our exclusive Wellness Refugium & Resort Hotel Alpin Royal****S.
Enjoy 4 days under the beacon of enjoyment of nature, wellness & togetherness in our Wellness Refugium & Resort Hotel Alpin Royal****S and renew your romance. Not available on public holidays. 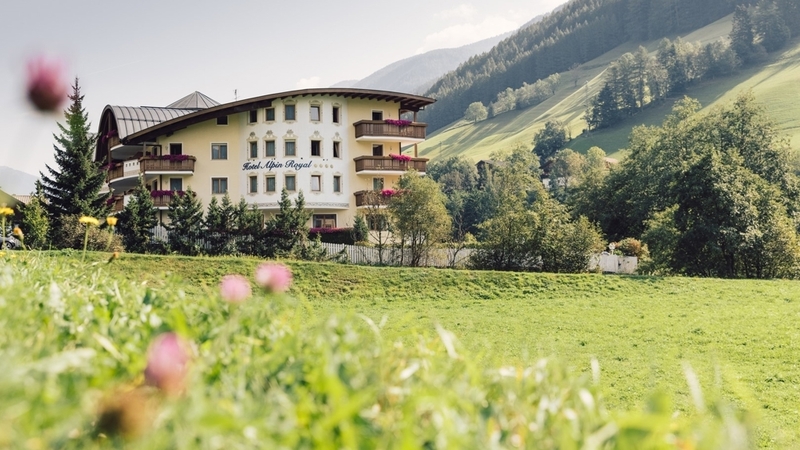 Just like the Alpine landscape around you is bursting into bloom, you can recharge and gather new strength in tune with nature and discover our Wellness Refugium & Resort Hotel Alpin Royal****S.
Come on up, almost right up to the sky. Enjoy crystal-clear air during fabulous summit hikes, walks to mystical mountain lakes and the fantastic panoramic views. Discover the trending sport of mountain biking and explore the Ahrn Valley’s diverse landscape during unforgettable biking tours high up on the mountains or, at a relaxed pace, through the valley. The Alpine region could not be more idyllic than at this time of year, while farmers bring in their hay, sun cosset mountains and valleys and nature presents itself in all its splendor. When fall arrives in the region, it transforms the surroundings into an artwork of golden hues. Enjoy this unique season to experience real hiking and wellness joys in the picturesque Ahrn Valley. Treat yourself to an all-around beauty week with wonderfully nurturing treatments from head to toe in our 4-star superior Royal Spa.